It’s that time of year, folks! Planning is under way for the 26rd Edmonton MS Ride. Come out and join our merry band. 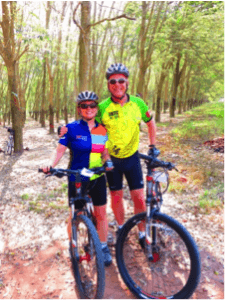 EBTC has a long-standing relationship with the Multiple Sclerosis Society in the annual MS ride. 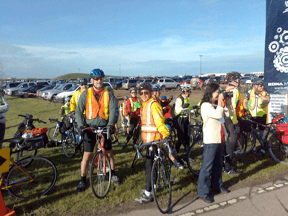 EBTC members volunteer their time and talents as Ride Marshals. It’s a great ride and weekend to boot. Take advantage of this opportunity to help people raise over $2 million in support of MS research and support, and oh by the way, have a lot of fun. 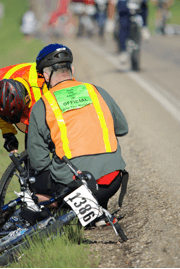 Limited space is available for volunteer route marshals. Part of “the deal” is you must register yourself as a volunteer with the MS Society. We do this to ensure you are on their books so you are assured of getting fed, communicated to, getting a dorm room if you want one, and covering you with MS Ride’s insurance (because this isn’t an EBTC ride it’s not covered by EBTC’s insurance). Click on the ‘Volunteer’ button . What’s the scoop this year? The ride will once again be from the Ritchie Brothers auction site in Nisku to the Camrose Regional Exhibition Grounds, and back the next day. Overnight accommodation in the Augustana University College dormitory at Camrose will once again be first-come-first-served to those volunteers who get their volunteer registrations in early. The date stamp on the Volunteer Application form (or verbal confirmation you have sent the snail mail copy) rules. Camping is unlimited, and close to the dinner / dance / start / finish at the Exhibition Grounds. What do I have to do, you ask? We spread ourselves throughout the pack, a pair of marshals for every group of about 100 cyclists. Mostly, just share what we do on a club ride: that is help out fellow riders! Make minor bike repairs like fixing flat tires, adjusting seats, etc. Advise about riding technique and etiquette, hydration and so on. Reinforce cycling safety rules (riding single file, signalling, no iPods, etc). In case of an accident we do what we can, and phone for one of the numerous support vehicles to attend. Starting in Nisku on Saturday morning, we ride about 90 km out to Camrose. After a huge dinner and a gala party on Saturday night, sleep in college dorms or camp. Then bright and early (well, uh, early …) cycle back to Nisku on Sunday. There are lots of support vehicles from United Cycle, CPRN and St John’s Ambulance. A pleasant weekend in support of a worthy cause. Most people know someone with MS; this is a great way to say “I support you”. Good endurance training for the upcoming summer tours. Free dorm accommodation (if you register early – space is limited), meals, and admission to the Saturday night gala dinner and dance. You can still fund-raise for MS and you don’t need to meet a quota. A free volunteer t-shirt to show off to your bikemates. You can, and should, be a member of the EBTC “Pre-Descents” corporate team. If you DON’T want to marshal but DO want a pleasant early season ride, register as a pledge rider and raise some funds! See http://mssoc.convio.net/site/TR?fr_id=3891. As EBTC members, just returning from cycling in Vietnam, we were asked to submit a short synopsis of our trip. We hope you enjoy it and we encourage other members to submit tales of their adventures! 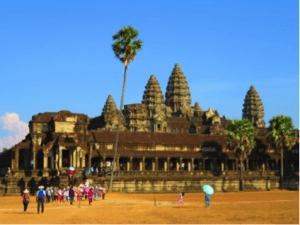 We started with a short stay in Siem Reap, Cambodia where for 4 days and nights we acclimatized and overcame mild jet lag. The main focus, however, was to tour the extensive Angkor temples including Angkor Wat (see photo), Ta Prohm (where Tomb Raiders was filmed), Bayon, and others. 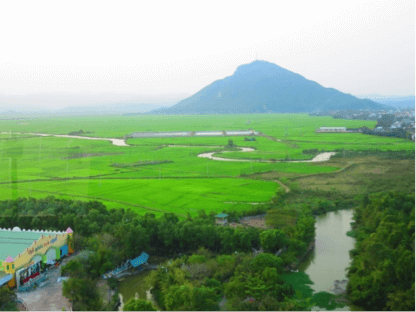 From there we flew to Ho Chi Minh City, Vietnam where our cycling adventures began. We toured with a company called Spice Roads, who are headquartered in Thailand and suffice it to say we would highly recommend them. 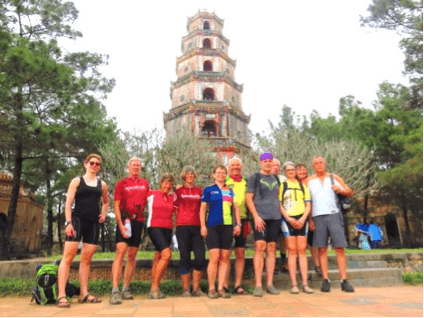 Through small cities and villages, over mountain passes, along country backroads and stunning coastal roads, our group of 11 cyclists (5 Canadians, 3 New Zealanders, 2 Americans and 1 Brit) along with 2 local tour guides explored Vietnam from Ho Chi Minh City to Hanoi. Over 17 days our senses of sight, sound, taste, smell and touch were tantalized while travelling by bike, bus, plane, overnight train, hovercraft, traditional boats and of course, by foot. 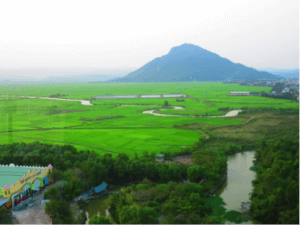 From the beautiful sandy beaches, bright green rice paddies, incredible limestone karst formations and panoramic mountain top views to the many historical sites (Cu Chi tunnels, museums, temples, pagodas, mausoleums), our eyes witnessed the beauty of Vietnam. Our ears heard Vietnam through the constant horn honking warning of passing scooters/motorcycles/buses/trucks (on the left or the right!!! 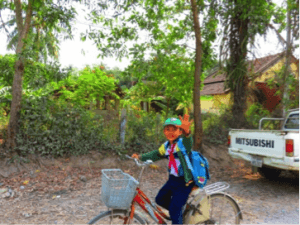 ); the beautiful birds singing in the trees; the children greeting us with a loud and fond “Hello” while they were riding to or from school or from the doorways of their homes; the South China Sea waves crashing on the beaches and the gibbons gently calling in the Primate Rescue Centre. Our taste buds were enticed by the amazing food in Vietnam – fresh seafood, rice, noodles, soups, chicken, beef, pork, tofu, vegetables –(so many types of greens to enjoy) and fresh fruit (pineapple, watermelon, bananas) along with all the flavourings – mint, cilantro, fish sauce, chilies, lemongrass, garlic, onions, peanuts. Our noses were met with smells that were both enjoyable (street food vendors set up curbside, the saltwater of the South China Sea, fresh rain, fresh baguettes) and not-so-pleasant (fresh fish markets at 7:30 in the morning – typically, not what we land lubbers like to smell in the morning J). We felt the hot sun on our heads and winter white skin (thankfully protected by sunhats, sunscreen and clothing); the heavy humid air that had us sweating even while at rest; the refreshing cool water (while snorkeling or taking a dip in the ocean or pools); the wind cooling us as we descended for 30 km from the central highlands near Dalat into the tropical coastal area of Nha Trang; and the gritty mud that covered us from head to toe after each of the two days of cycling in the rain in the Cuc Phong National Park area. We also felt the emotional satisfaction, yes, even exhilaration; you get after completing a challenging day of cycling. Whether the challenge was due to distance, mountain climbs, heat, humidity or route conditions (gravel, dust/dirt, slimy mud mixed with water buffalo splattering, broken tarmac, muddy berms between the rice paddies, etc. ), we loved it all! 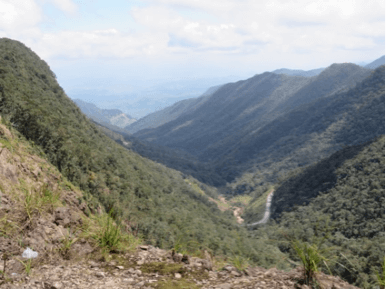 We are convinced, yet again, that: YOU CAN’T BEAT EXPERIENCING A COUNTRY FROM THE SADDLE! YOU JUST CANNOT! (Proudly wearing our EBTC 35th anniversary and 2014TDA jerseys – en route to the Cu Chi tunnels near Ho Chi Minh City). New for 2015, an early spring “Southside Beginner Ride Series.” Brought to you by Dennis Nolan. Dennis has been a club member for about 8 years but only participated more regularly in the past few years. In 2011, he was the newsletter coordinator. He prefers the more easy going rides, shorter distances and slower speeds, and as such, decided to lead some! He enjoys wandering the city and countryside looking for nice areas to ride. 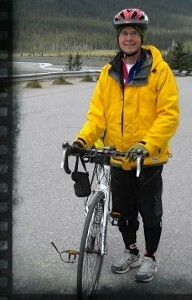 He has loved cycling from a young age wandering the countryside around Toronto in the late 1960’s. When he was 22, he and a friend took their 3 speeds on the train from Toronto to Halifax and rode around the Maritimes, camping along the way. He also enjoys hiking, and a bit of snowshoeing and XC skiing in the winter.